Bonded teams are better teams. Watch the video to find out more. Team Bonding was established in Sydney in 2007 and we’ve grown every year since. For each of the past 4 years we have run creative, fun and memorable teambuilding events for over 300 blue chip client teams, many of whom come back to us over and over again. 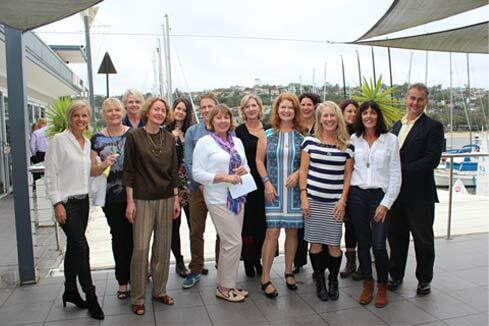 The founder, Cate Richards, believes that to balance the pace of corporate life today it is vital to pause once in a while to reward all that effort and celebrate achievements with some good old-fashioned fun and laughter. The most successful teams have a common purpose, consistently excellent delivery, strong communication skills and a degree of mutual respect. But there is an X factor, and that is team spirit and rapport, which absolutely can be worked on. All the high performing teams Cate has met in the last 11 years have strong interpersonal bonds and great rapport. The smart managers who work with Team Bonding find that their people are happier and more productive working with team members they like and respect. People who enjoy spending time with colleagues stay in jobs longer and are more committed to positive outcomes. Our results and testimonials show that there’s no better way to build rapport and positively influence team spirit than to dedicate time to fun and togetherness outside of the structures of the work environment. It doesn’t have to cost a lot and it doesn’t have to be complicated. Time invested in rapport building pays long term dividends. We are Sydney’s specialists in fun team building activities for corporate groups. 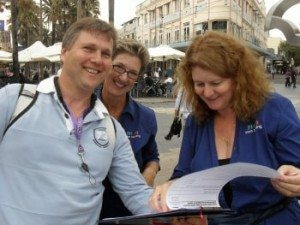 At left are Cate and Jane Wallen (our former general manager extraordinaire) with participant Gus on an Amazing Race in Manly way back in 2008. 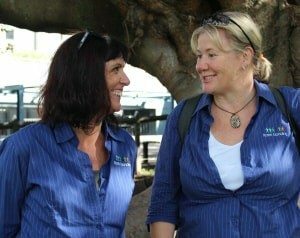 All our facilitators (like Kelly and Janell at left) are super organised and enjoy working with people. They love their jobs and will ensure your event is brilliant. We love working outdoors, in the best parts of Sydney. 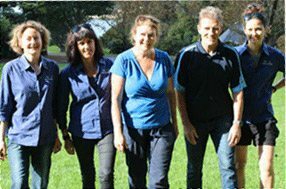 Here in the gorgeous Botanic Gardens are Wendy, Kelly, Cate, Mark and Fran. We choose the same kind of activities that would be enjoyable for a group of friends, so your team ends up with the chemistry of a friendship group. By taking part in a great shared experience your team creates memories, conversation, laughter and good times. We have experience with all types of team requirements, and will more than likely have an event to suit you. We do have events that suit people with disabilities. We aspire to be the safe hands that you entrust with your event. We help you every step of the way so all you need to do is wait to the banks to pour into your inbox.